Can I Checkout As A Guest Even If My Email Is Registered? 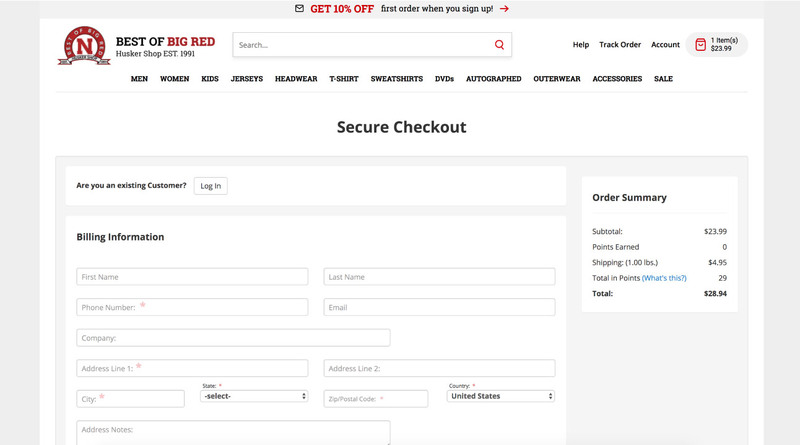 Yes, it is guest checkout by default. How Long Will It Take If I Mail In The Catalog Order Form? Due to the limited nature of some items, we strongly encourage customers ordering from our catalog to call in their order to our sales staff at 800-230-3831. If you do mail in an order please provide your most up-to-date contact information and allow 2-3 weeks for delivery. In some instances, we may not be able to fill your order and will contact you via the phone number or email address provided on your order. How Do The Gift Certificates Sold On Your Site Work? We sell gift certificates on our site that can only be redeemed on BestofBigRed.com. When you add them to your shopping cart you will have the option of adding a recipient to send it to or you can purchase it for yourself. A redeemable gift certificate code will be emailed to you or the recipient you specify on the order. To redeem the gift certificate, the code must be entered in the box pictured below exactly as it appears in the email confirmation. You must hit the yellow "+" button next to the gift certificate code before submitting the order to redeem your gift certificate. If you are interested in purchasing a gift certificate that is redeemable at our Clocktower Store please call 402-261-3752 to speak to someone at the store. If you are interested in purchasing a gift certificate that is redeemable at our Haymarket Store please call 402-435-0658 to speak to someone at the store. Orders shipping to military APO addresses automatically receive a 10% discount. Orders to former players and coaches receive a 15% discount. Former player/coach discounts are only applicable to orders placed over the phone.